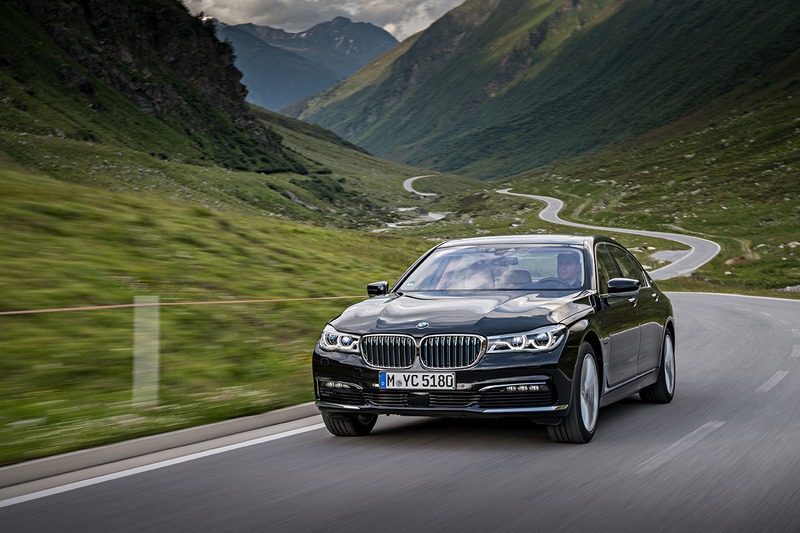 Official Release: The pioneering character of the new BMW 7 Series model range is in the spotlight once again with the introduction of an intelligent drive concept. 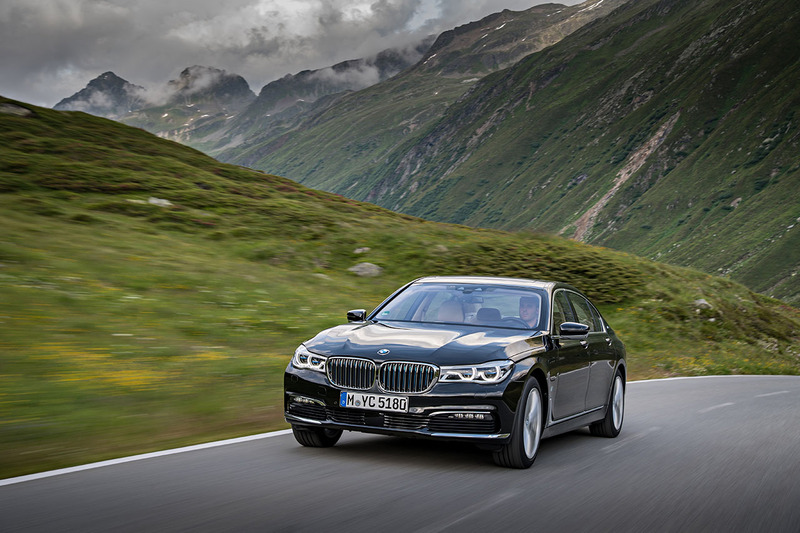 The BMW eDrive technology based on the knowledge gained from the development of BMW i cars has arrived in the luxury class and adds outstanding sustainability-led qualities to the new BMW 7 Series. 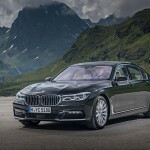 The new 2017 BMW 740e xDrive iPerformance is powered by a plug-in hybrid drive system using the precisely executed interplay of a four-cylinder gasoline engine with BMW TwinPower Turbo technology and an electrical machine integrated into the 8-speed Steptronic transmission to generate a system output of 322 hp. 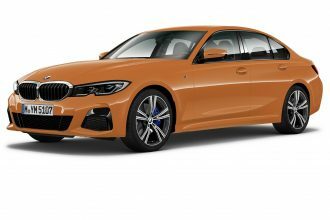 This iPerformance model features BMW’s intelligent all-wheel drive system to distributes the combined power of the combustion engine and electrical machine permanently and as required between the front and rear wheels. 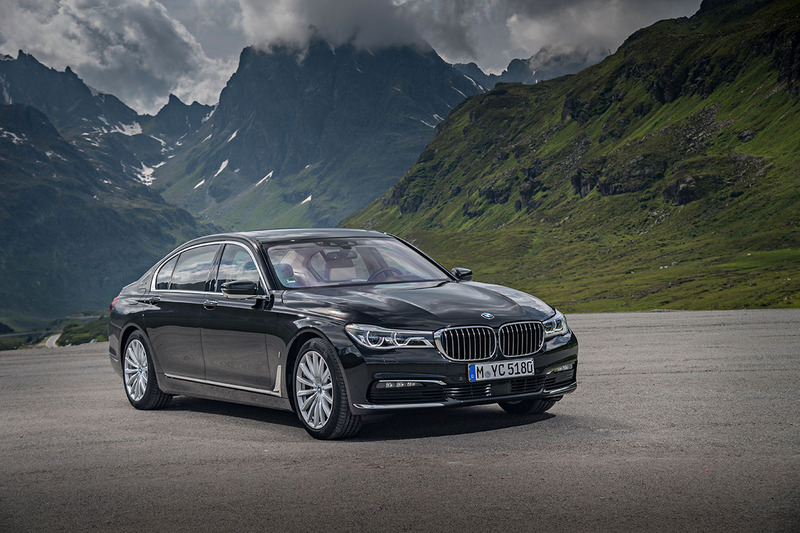 The 2017 BMW 740e xDrive iPerformance is already in production and will arrive at U.S. dealerships in August starting at $89,100 plus $995 Destination and Handling. 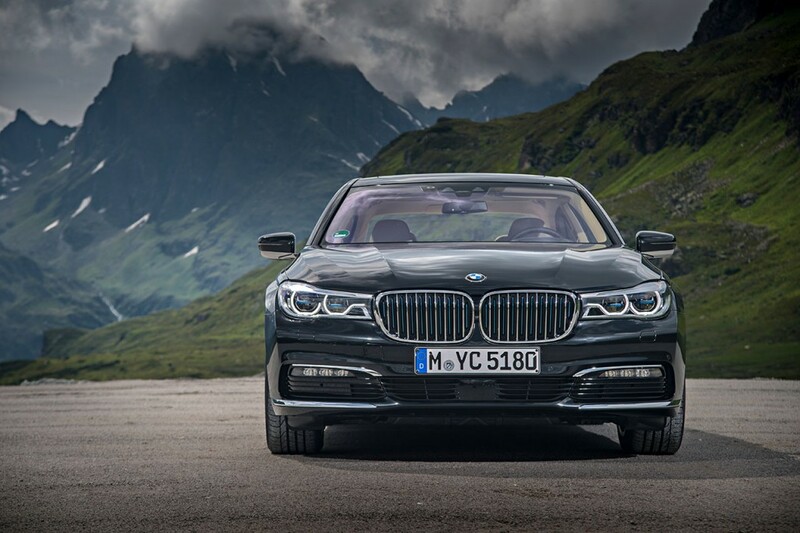 The plug-in hybrid variant of the new BMW 7 Series delivers a dynamic driving experience and long-distance comfort with the added virtues of all-electric, locally emission-free mobility. 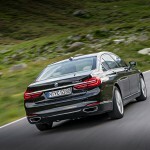 The BMW iPerformance Automobiles represent the most rigorous implementation of BMW EfficientDynamics. 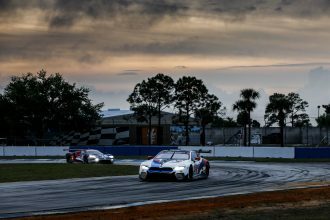 Their BMW eDrive technology teams up with intelligent energy management, an extensive weight-reduction program as part of BMW EfficientLightweight and innovative aerodynamics optimization measures. 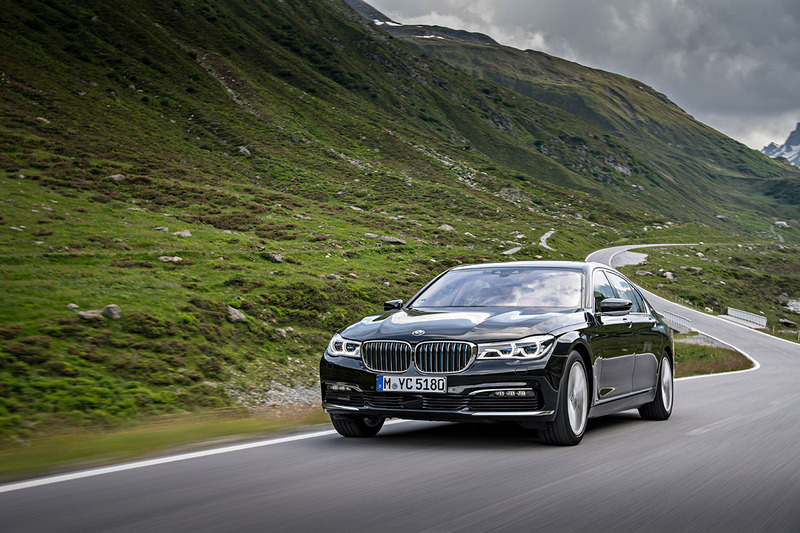 The BMW Group defined the sustainability targets for the new BMW 7 Series to include the vehicle’s entire life cycle since the beginning of development. 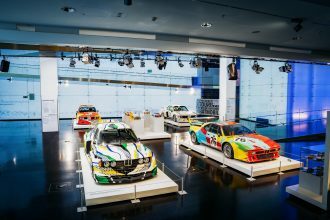 The environmental impact termed the “greenhouse potential”, is measured on the basis of the CO2e emissions produced by everything from the extraction of raw materials through the entire manufacturing, the actual usufruct of the vehicle and finishes with the recycling at the end of the vehicle’s life. 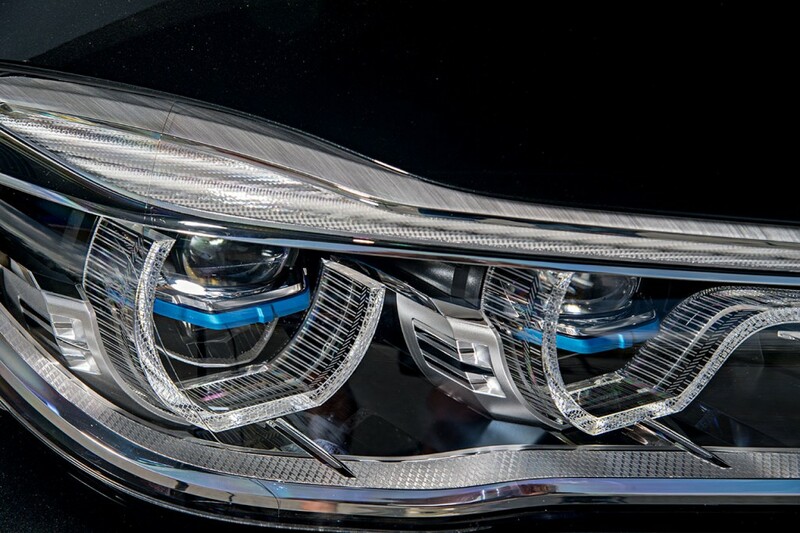 These improvements have been achieved through measures including the use of secondary aluminum in cast components and recycled plastics, and by increasing the proportion of power from renewable sources used in vehicle production. 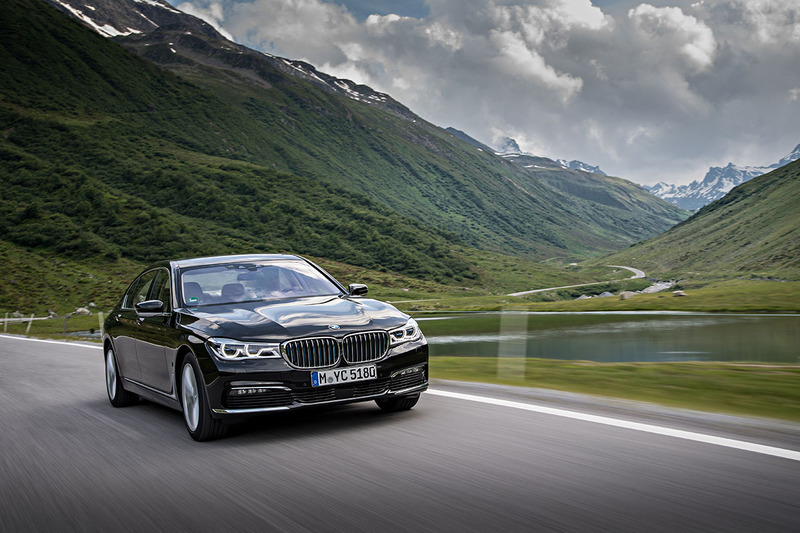 The BMW eDrive technology in the BMW 740e xDrive iPerformance ensures its greenhouse potential (CO2e) is approximately 30 percent lower than that of the gasoline powered 740i over the full lifecycle of the car. 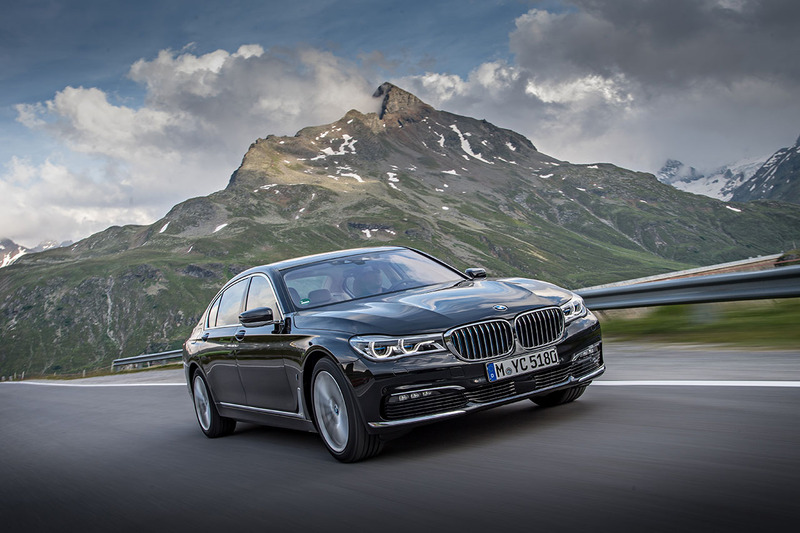 Like the BMW eDrive technology on the plug-in hybrid of the new BMW 7 Series, the intelligent lightweight design featuring carbon-fiber-reinforced plastic (CFRP) is also based on expertise forged in the development of BMW i cars. 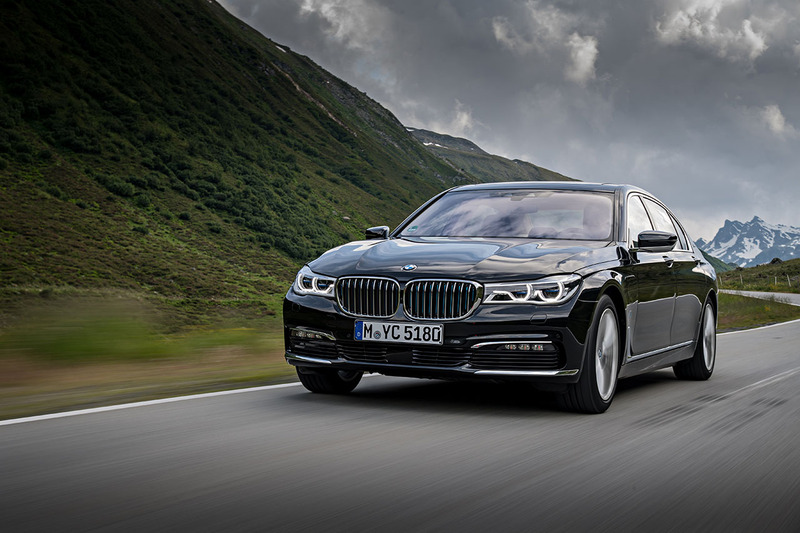 The body structure with Carbon Core, first presented in the new BMW 7 Series, is the result of the BMW Group’s unparalleled know-how in the industrial use of CFRP in the automotive industry. 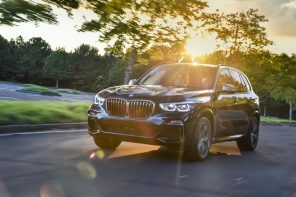 Experience gathered at BMW i has also been used in the model-specific configuration of the electrical machine, power electronics and lithium-ion high-voltage battery. 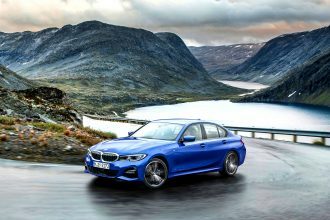 Customers can rely on innovative products and mobility services originally developed for BMW i cars, such as the BMW i Charging Station and the ChargeNow service, for charging the high-voltage battery at home and during a journey. 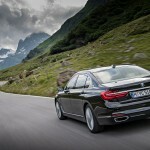 The BMW eDrive technology has been tailored specifically for the plug-in hybrid member of the new BMW 7 Series family. 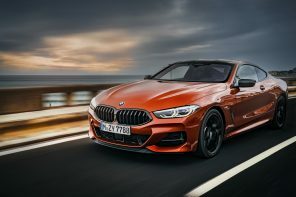 The electric boost function provides a noticeable increase in dynamic performance – expressed most prominently by the powertrain’s instantaneous responses – and combines with enhanced efficiency. 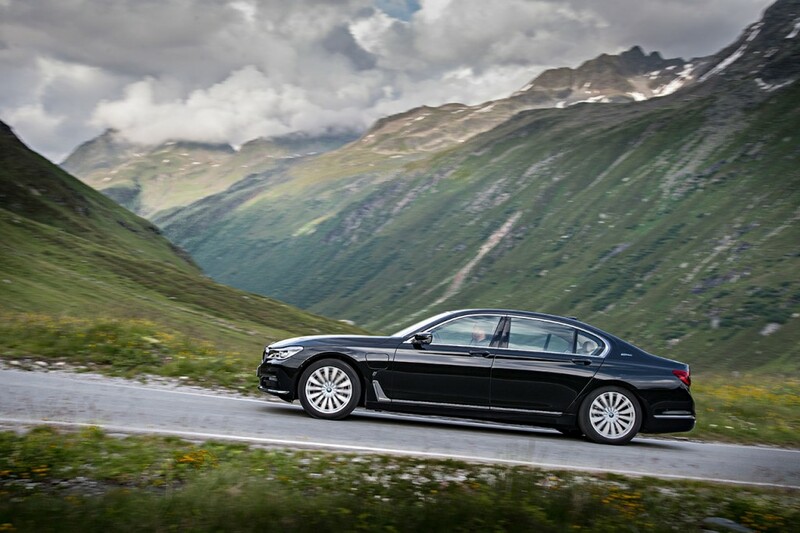 With its eDrive technology the BMW 740e xDrive iPerformance can be driven in all-electric mode up to 75 mph. 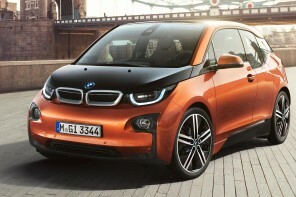 Combined fuel economy of 64 MPGe and an all-electric range of 14 miles is possible (EPA official figures). 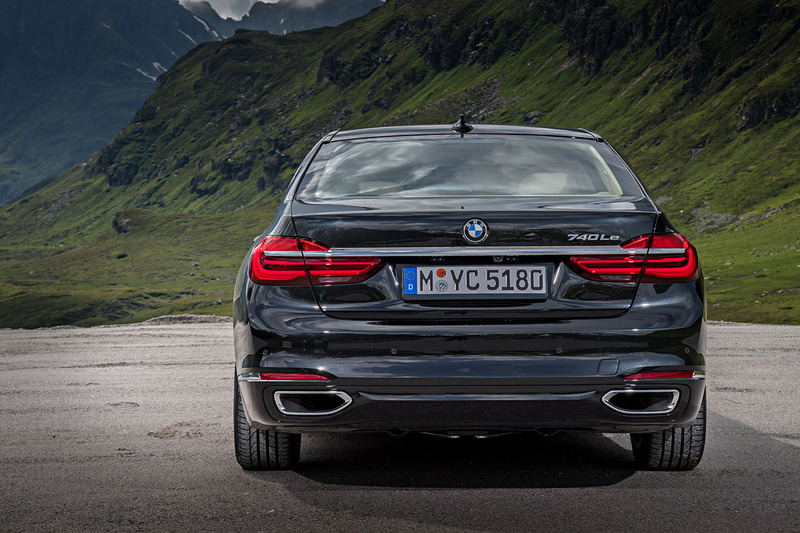 The best of two worlds: BMW eDrive and BMW TwinPower Turbo technology. 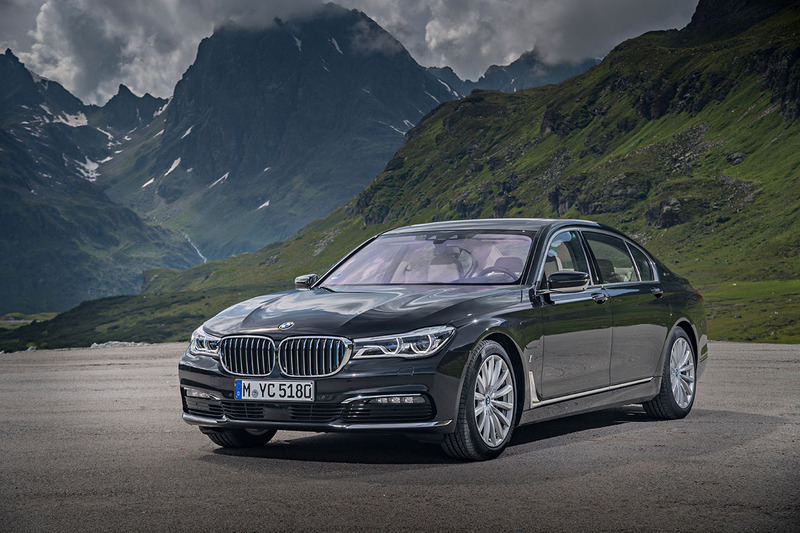 The plug-in hybrid system of the BMW 740e xDrive iPerformance brings together the latest innovations from the world of combustion engines and electric drive systems. 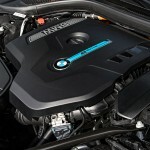 The combustion engine with BMW TwinPower Turbo technology belongs to the BMW Group’s new EfficientDynamics engine family. 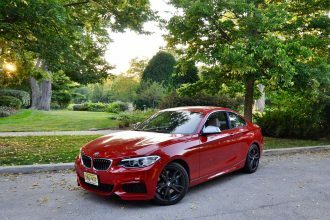 Developing a maximum output of 255 hp, it is the most powerful four-cylinder engine ever fitted in a series-produced BMW. Instantaneous power delivery and peak torque of 295 lb-ft – on tap between 1,550 rpm and 4,400 rpm, ensure dynamic performance at all times. 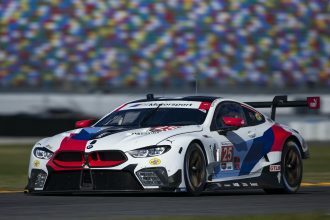 The new engine makes use of a TwinScroll turbocharger integrated into the cast-steel exhaust manifold, High Precision Injection with a maximum pressure of 200 bar, the latest version of VALVETRONIC variable valve lift and variable camshaft control on both the intake and exhaust sides (Double-VANOS). 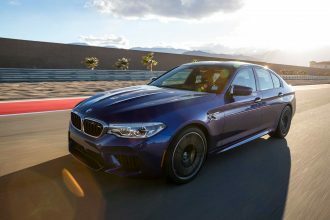 Balancer shafts with rolling bearing supports in the aluminum crankcase enhance the engine’s refinement, while the electrically controlled wastegate for the turbocharger optimizes power delivery. 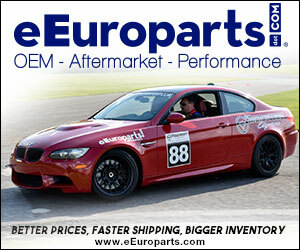 Moreover, electronically switchable engine mounts provide the connection with the body. 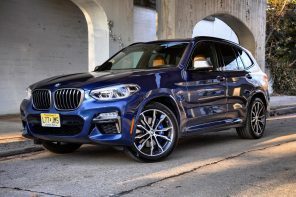 These mounts smooth out the vibrations caused by the engine as required, ensuring that all occupants experience exceptionally low vibration levels and the engine delivers outstanding refinement. 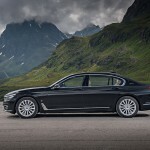 Since the iPerformance variant of the luxury sedan come with a specific, extremely powerful starter motor for the combustion engine and a compressor for the climate control system that operates using energy from the high-voltage battery, the gasoline engine is equipped with a special belt drive. 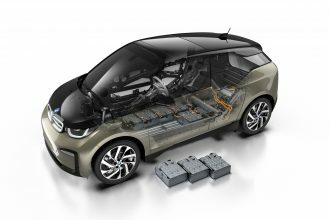 This removes the need to integrate the generator and refrigerant compressor as required in conventionally powered vehicles. 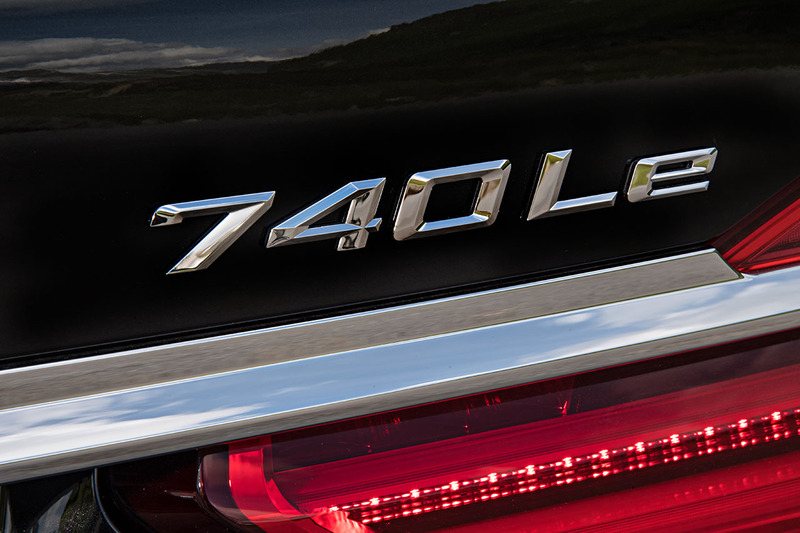 A large proportion of the engine’s output and torque available to be converted into dynamic performance. 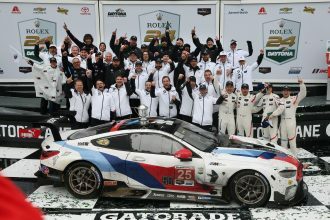 The electrical machine also displays hallmark BMW performance characteristics. Based on the principle of a permanently excited synchronous motor, the electric drive system stands out with its linear power delivery up into the higher reaches of the rev range and its exceptionally high level of efficiency. 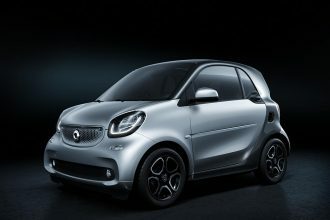 Its maximum output is 111 hp and, as is characteristic for electric drive systems, it serves up its peak torque of 184 lb-ft. 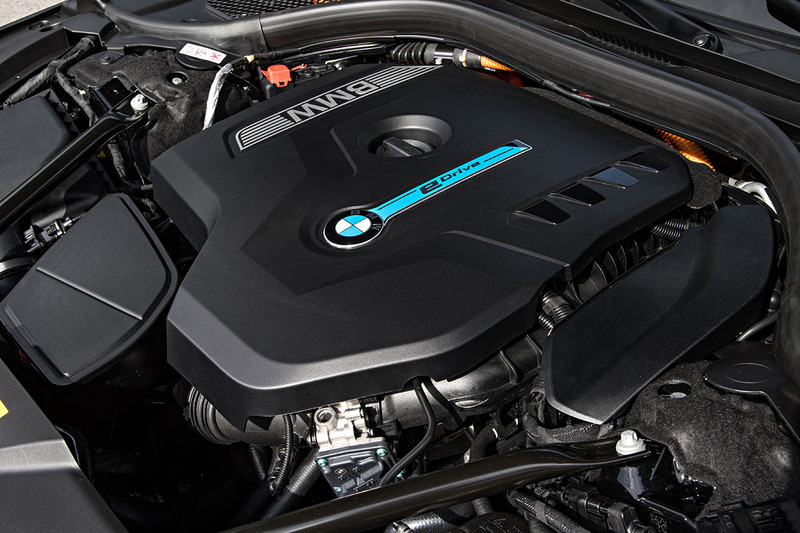 The boost effect for the combustion engine provides thrilling, instantaneous responsiveness and power build-up with absolutely no delay when accelerating. 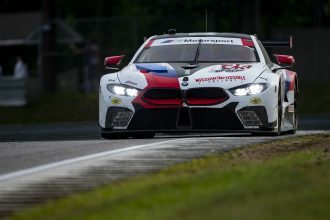 The electrical machine also takes on the role of a generator – powered, depending on the hybrid function selected, either by recuperating energy on the overrun and under braking or by efficiently raising the engine’s load points. It then feeds the energy it generates into the high-voltage battery. 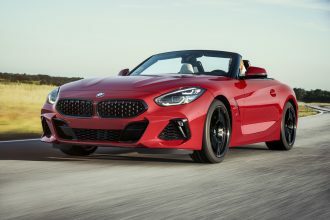 The electrical machine is fully integrated into the car’s 8-speed Steptronic transmission ensuring optimal operation of pure-electric driving, electric boost and recuperation of braking energy. 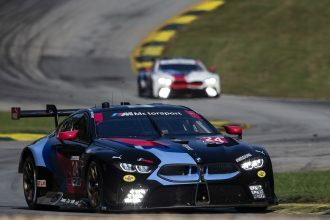 This integration also means the transmission does not require a torque converter (enabling a reduction in weight), while the electrical machine takes over the function of the starter element. 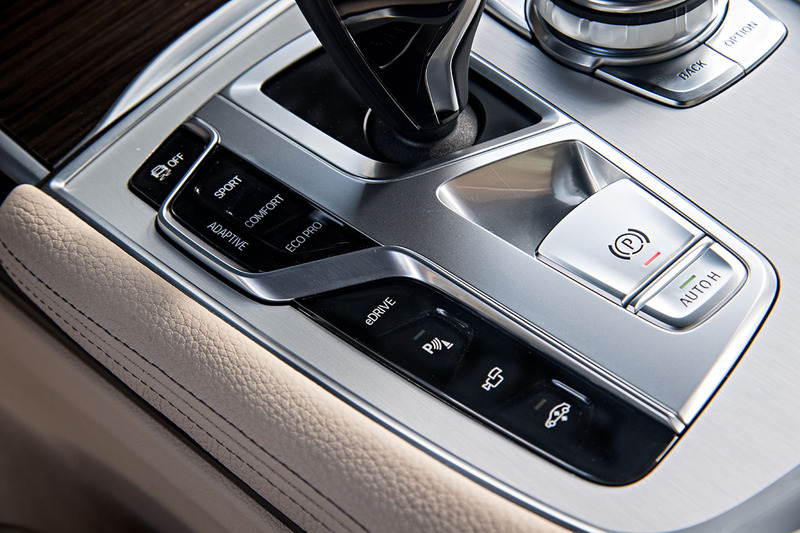 The 8-speed Steptronic transmission combines efficiency, comfort and dynamic gearshifts at a high level. The transmission’s broad spread of ratios helps the car quick acceleration figures but also promotes low energy consumption when driving at higher speeds. Gearshift paddles on the steering wheel are standard, enabling the driver to make manual gear selections with exceptional swiftness and the greatest of ease. 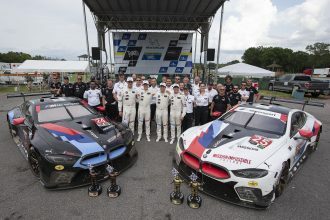 Working together intelligently, the combustion engine and electric drive system bring a system output of 322 hp and combined peak torque of 369 lb-ft. 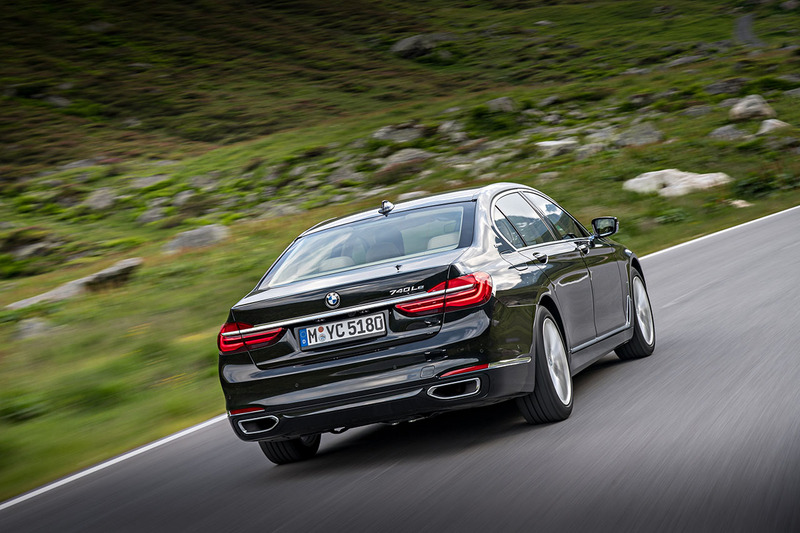 Immediate response to every movement of the accelerator and sustained delivery of dynamic power allow the BMW 740e xDrive iPerformance to dash from 0 to 60 mph in just 5.1 seconds. 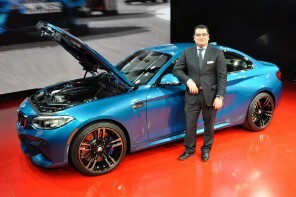 The top speed is electronically limited to 155 mph. 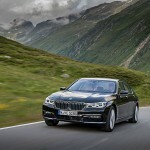 BMW’s intelligent all-wheel drive system. 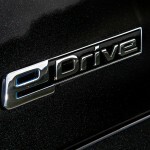 BMW eDrive can be combined with a large number of combustion engines and model-specific drive configurations. 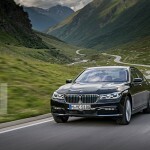 The BMW 740e xDrive iPerformance follows the same concept as the BMW X5 xDrive40e iPerformance Sports Activity Vehicle as the brand’s second model to distribute its power permanently to all four wheels in all drive combinations. 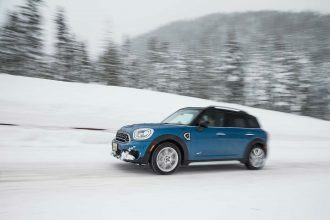 The intelligent all-wheel-drive system ensures ideal traction, optimized directional stability and enhanced agility through corners in all weather and road conditions. 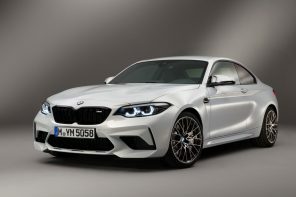 An electronically controlled multi-plate clutch enables the fully variable distribution of the engine’s power between the front and rear wheels. 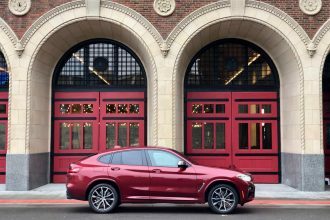 By linking up with DSC (Dynamic Stability Control), the xDrive system can act in advance to counter understeer or oversteer and direct the power from the engine and electrical machine to optimize handling dynamics at all times. 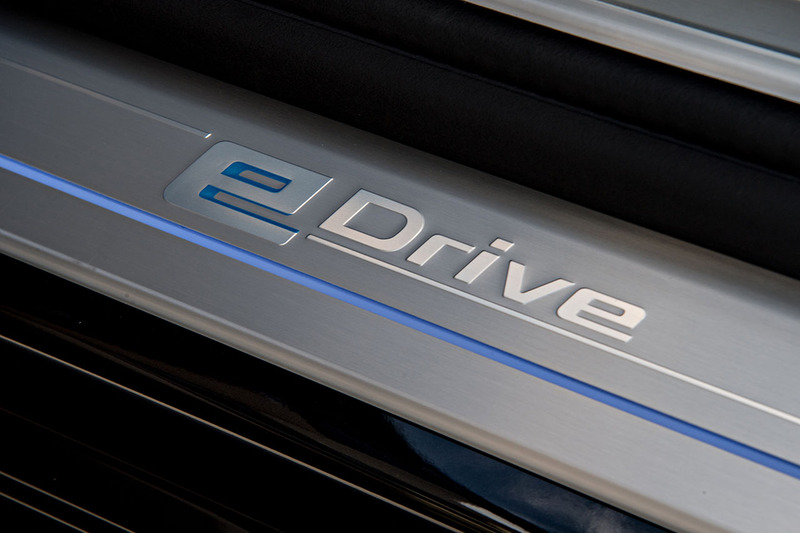 The eDrive button on the center console allows the driver to select from the AUTO eDRIVE, MAX eDRIVE and Battery Control settings, to determine the operating approach of the plug-in hybrid drive system. 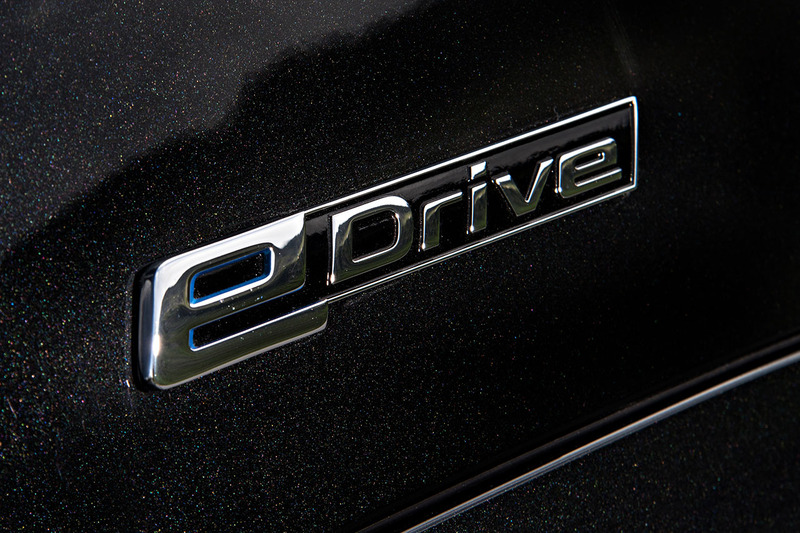 AUTO eDRIVE, which is automatically activated when the vehicle starts up, uses intelligent energy management to ensure the combustion engine and electrical machine work together to the best possible effect in terms of both efficiency and dynamics. 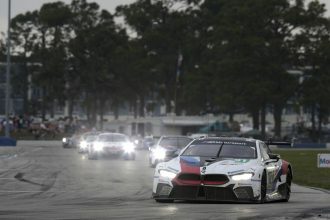 The operating strategy defaults to all-electric mode at low and moderate speeds to utilize the advantages of locally emission-free mobility as widely as possible. 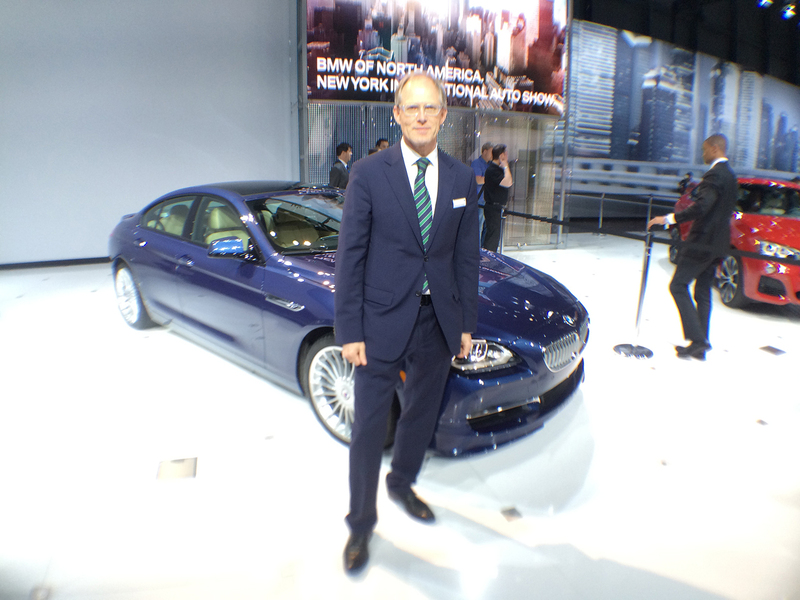 The combustion engine only joins in at a speed of 50 mph or under heavy throttle applications. The electrical machine ensures the switch from pure-electric to hybrid mode takes place extremely smoothly. The electric drive system also delivers additional torque through its boost function allowing instantaneous throttle responses and a noticeable increase in pulling power at all times. 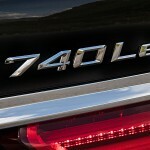 These characteristics lend the engine the appeal of a unit with a far larger displacement. 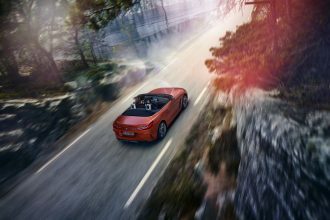 The electric assist function enables a targeted lowering of the engine’s load points when greater power is needed, and that enhances the system’s efficiency. Whenever the navigation system’s route guidance function is activated, proactive energy management adapts the drive system’s operating strategy to optimize efficiency. It also ensures the high-voltage battery has sufficient charge remaining to reach the selected destination in pure-electric driving mode. The driver can switch to the MAX eDRIVE operating function at the touch of a button. 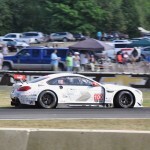 In this setting, the car is powered exclusively by the electrical machine, although the combustion engine can be activated at any time by pushing the accelerator into kickdown. The Battery Control setting allows the charge of the high-voltage battery to be set manually. 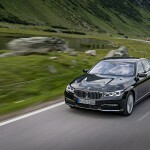 The driver can input a target value between 30 and 100 percent of maximum charge, which is then available for pure-electric driving later in the journey. Depending on the driver’s requirements, the charge of the high-voltage battery is maintained at a constant level or – using the electrical machine’s generator function – increased to the target charge level selected. 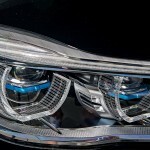 For example, electric power can be held back or even increased while on the highway so that it can be deployed subsequently for locally emission-free driving. This strategy allows the use of electric energy in a targeted manner and at the desired time. 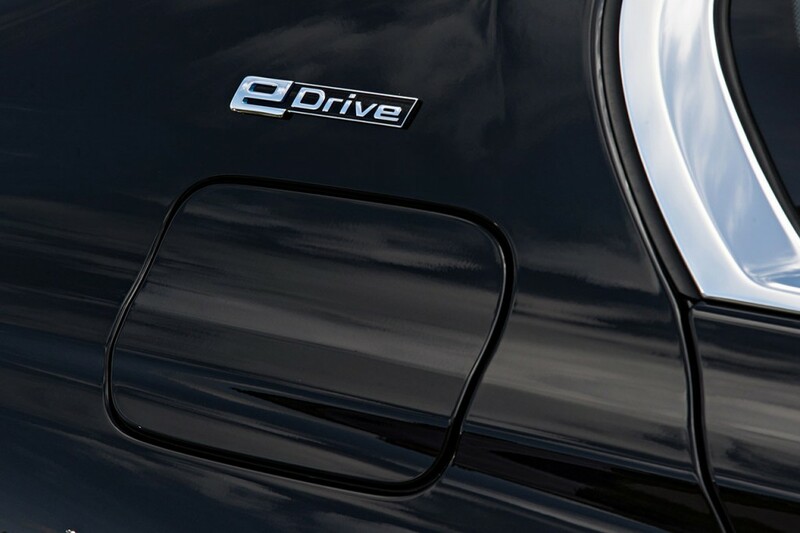 Regardless of the setting selected via the eDrive button, when the gearshift lever is moved into the S position the engine turns on as required to ensure the maximum combined output of the two drive systems is permanently available. 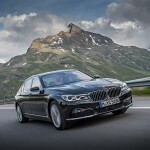 Driving Dynamics Control switch with ADAPTIVE mode. 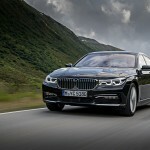 The iPerformance model of the new BMW 7 Series is also fitted as standard with the newly designed Driving Dynamics Control switch on the center console. At the touch of a button, the driver can activate a vehicle setting that optimizes dynamics, comfort or efficiency. 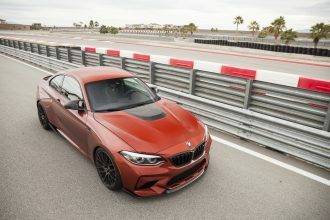 Their selection adjusts the characteristics of the accelerator and steering, the gearshift profile of the Steptronic transmission and the responses of the Dynamic Damper Control system. The range of characters encompassed by the ECO PRO, COMFORT and SPORT modes are even more clearly defined than with conventionally powered vehicles. 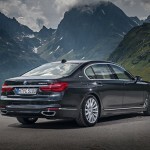 COMFORT mode provides the plug-in hybrid BMW 7 Series model with a smoothly balanced overall set-up. 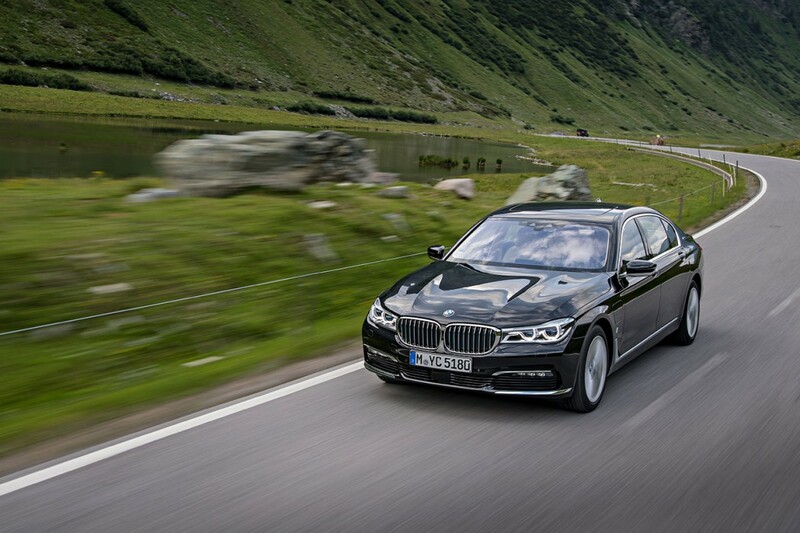 In this mode, the electrical machine delivers relaxed driving with the lowest possible energy consumption. 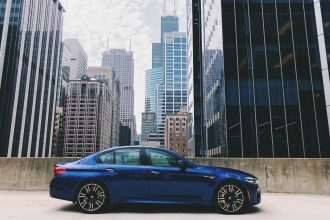 In SPORT mode the power of both the combustion engine and the electrical machine team up to provide a firmer damper setting, increased accelerator response, sharper gear shift dynamics and direct steering characteristics to maximize dynamic performance. 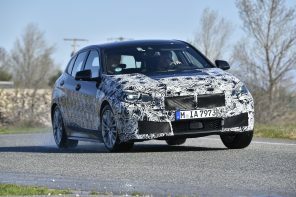 The electric boost function is also increased, as is recuperation under braking and on the overrun. The hybrid-specific version of the ECO PRO mode supports an operating strategy which aims to maximize the car’s electric range. As a result, the electric boost function supplementing the power of the combustion engine is only activated if the accelerator is pushed into kickdown. Energy recuperation on overrun also takes a limited strategy. 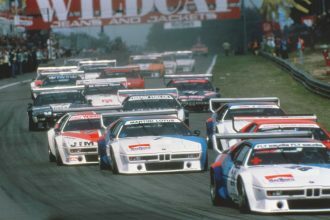 Instead, a hybrid-specific coasting function is triggered at speeds between 25 – 100 mph. As soon as the driver releases the accelerator, the combustion engine is switched off. 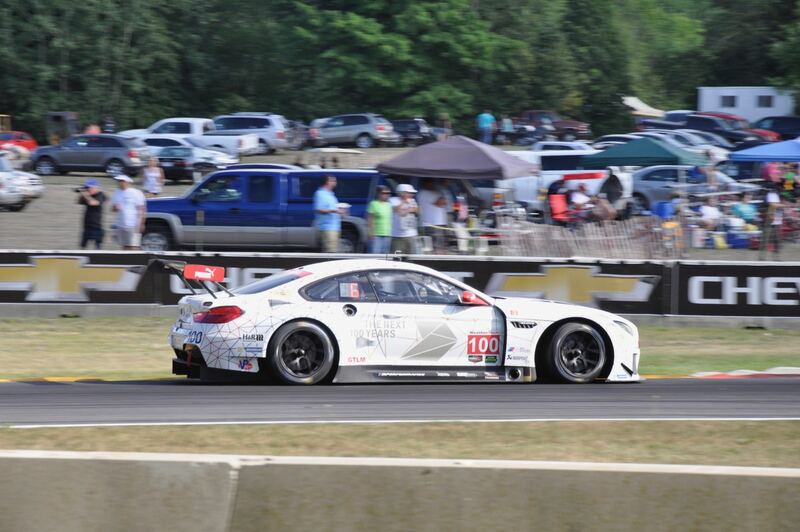 In addition, recuperation of braking energy is reduced to the level required by the onboard power supply. The car therefore runs on the minimum possible energy consumption and with the lowest possible mechanical resistance. 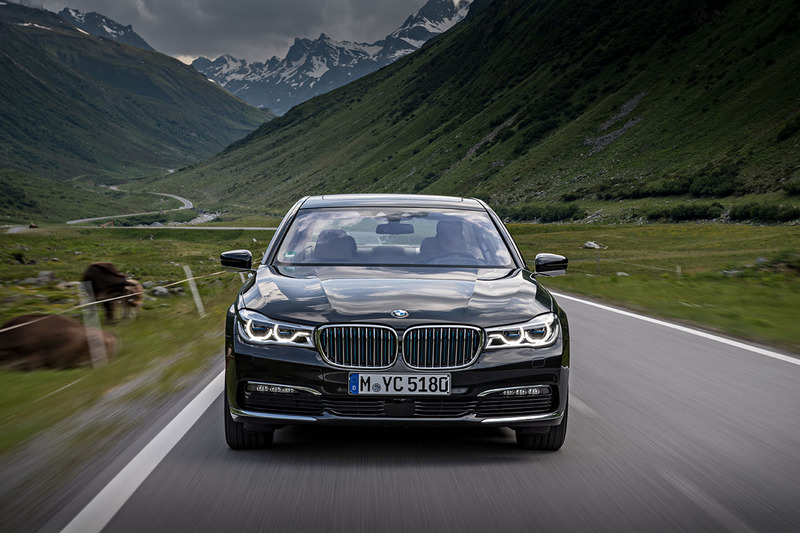 As with the other models in the new BMW 7 Series, ECO PRO mode features precisely measured power control for electrically operated convenience functions, such as the climate control system, seat heating and exterior mirror heating. 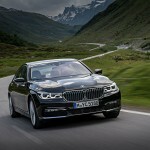 The Driving Dynamics Control switch also offers drivers of plug-in hybrid variants of the new BMW 7 Series the option of selecting ADAPTIVE mode. 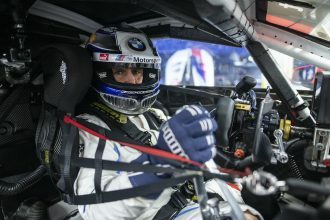 In this setting, the car adapts to the driver’s style and route profile, taking their cues from movements in the steering wheel, accelerator and brake pedal, as well as from the position of the gearshift lever (D or S position). 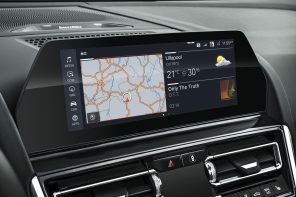 The navigation system’s map data is used to ensure the right set-up option is made available when the driver switches from city driving to highway, for example, as well as on twisty sections of road or when approaching an intersection. 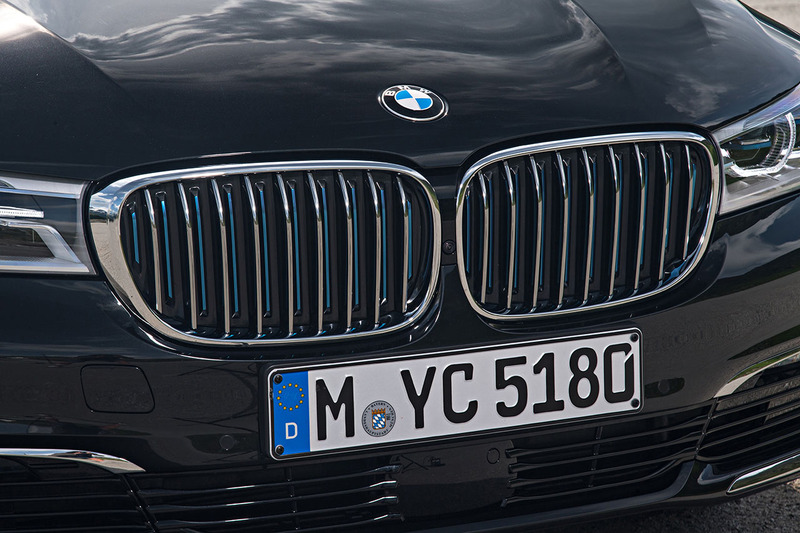 High-voltage lithium-ion battery: developed specifically for BMW iPerformance. 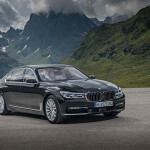 The high-voltage lithium-ion battery in the BMW 740e xDrive iPerformance stands out with its compact construction and has a gross capacity of 9.2 kWh (net capacity: 6.5 kWh). It consists of 96 cells arranged in six modules and has its own cooling system integrated into the climate control system for the interior. The high-voltage battery was developed specifically for this model and is accommodated underneath the rear seat bench in a space-saving position that also ensures optimum crash safety. 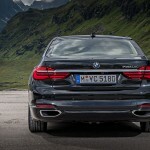 As in its BMW 7 Series siblings, the trunk area of the new BMW iPerformance variant also benefits from a level surface and high-convenience practicality. 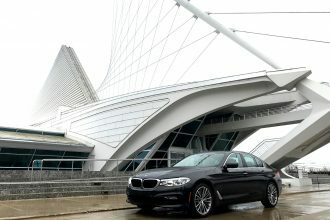 It provides 14.8 ft3 of space, which far exceeds that of comparable plug-in hybrid models in the luxury sedan segment, while extra capacity can be gained by using the storage compartment underneath the load compartment floor, lowering the cover in the rear section of the trunk or opening the side storage compartments. The energy flow between the high-voltage battery, electrical machine and charger is controlled by power electronics also developed specifically for this iPerformance model. The power electronics also regulate the supply of energy from the high-voltage battery to the 12V onboard electrical system via a voltage transformer. 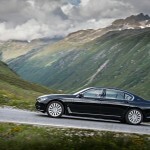 BMW 360° Electric Lifestyle: Simple, convenient and flexible charging. 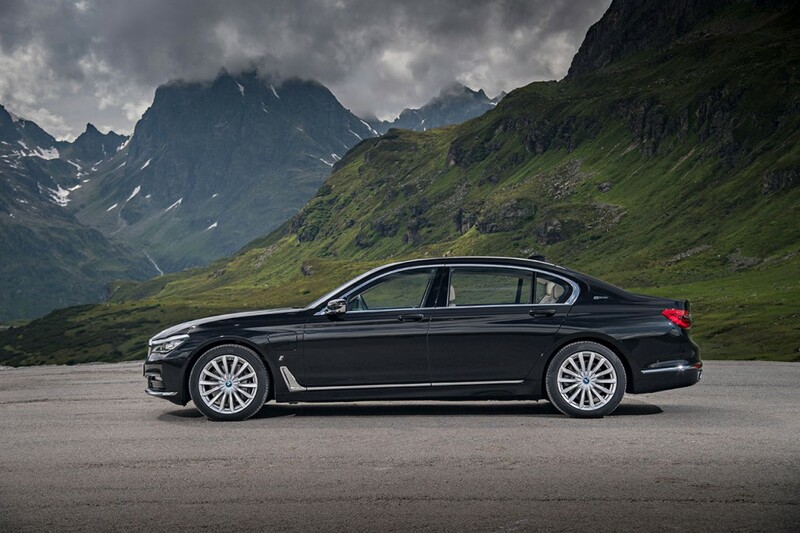 The high-voltage battery on the 7 Series iPerformance can be charged from most dedicated standard household outlets (120V), or for more convenience, a BMW Charging Station designed for quicker charge time at home. 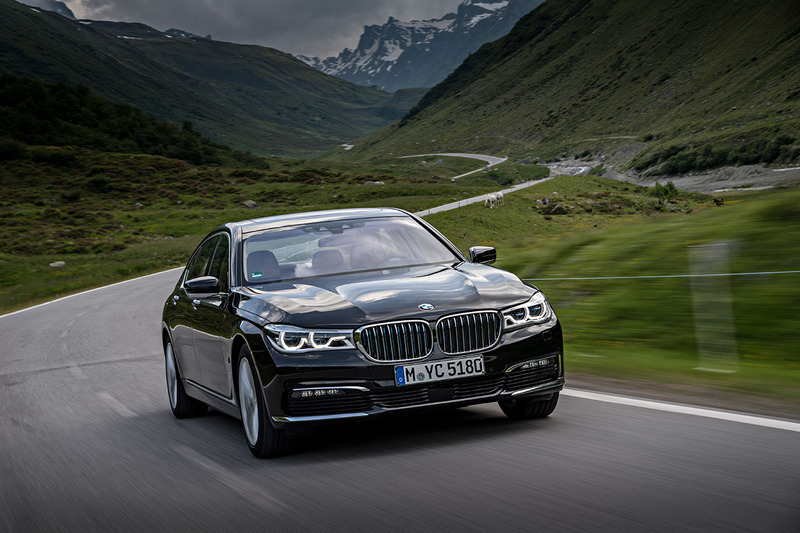 On the go, drivers can easily access participating public charging stations using the ChargeNow access card included in every BMW 740e xDrive (in the glovebox). 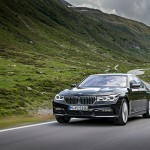 The BMW 740e xDrive iPerformance comes standard with a Level 1 charging cable (“Occasional Use Cable” “OUC”), which is stored in a bag and can be held in place using a tension belt on the left-hand side of the trunk. 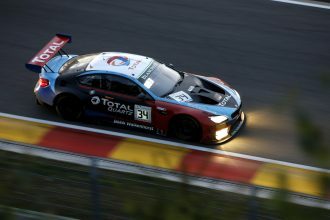 The battery can be charged to full capacity in under 7 hours from a residential 120V outlet using the OUC, while tailor-made solutions enabling safe, straightforward charging are available through BMW 360° Electric Lifestyle, such as the BMW Installation Services and BMW Solar Energy programs. 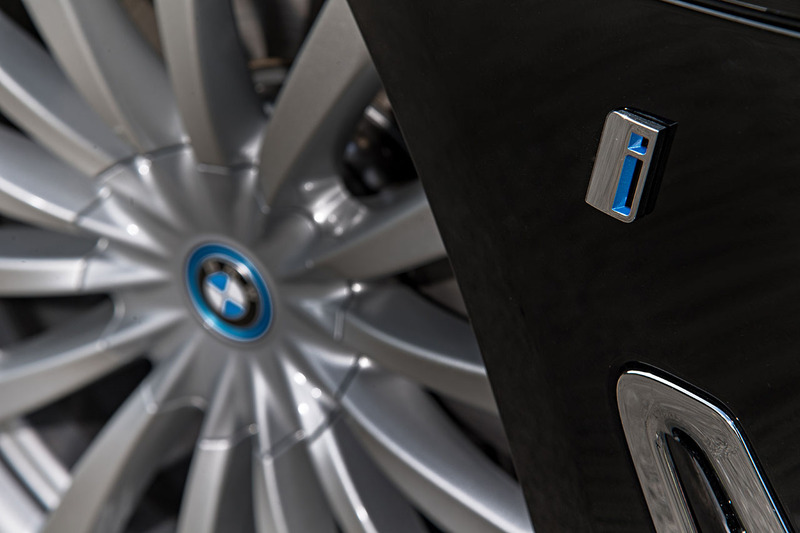 The BMW Charging Station uses its output of 3.6kW – 7.2 kW (16/32 A, 240 V) to reduce charging time to just under three hours, to wake up to a fully charged vehicle each day. 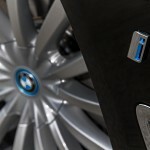 The progress of the charging process can be tracked via a graphic in the car’s instrument cluster or the BMW Connected app on a smartphone. 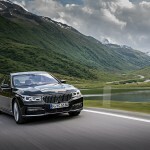 BMW 360° Electric Lifestyle offers an all-encompassing concept covering the supply and installation of the residential charging station and other services. 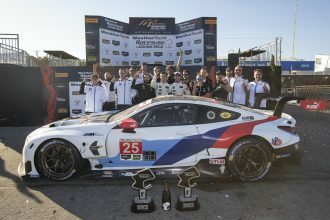 ChargeNow, the public charging program for BMW drivers, grants single-card access to partner public charging stations, while the BMW Solar Energy Program allows the driver to fuel the vehicle and the home with clean, renewable solar energy. Hybrid-specific Instrument Cluster and Central Information Display. 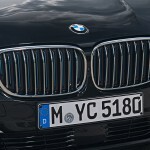 The charger connection for the high-voltage battery, which can be found under the flap in the left-hand front side panel of the BMW 740e xDrive iPerformance, points to the character of the drive concept, as does the “eDrive” badge on the C-pillars and the door sill plates. The high-set position of the connection makes the charging process easier. 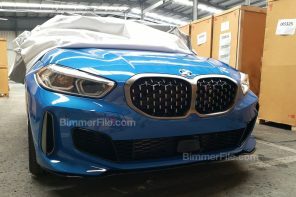 The transfer of technology from BMW i is also noticed by the BMW i logo on the front side panels (left and right), the BMW kidney grille bars in BMW i Blue and blue hub covers. 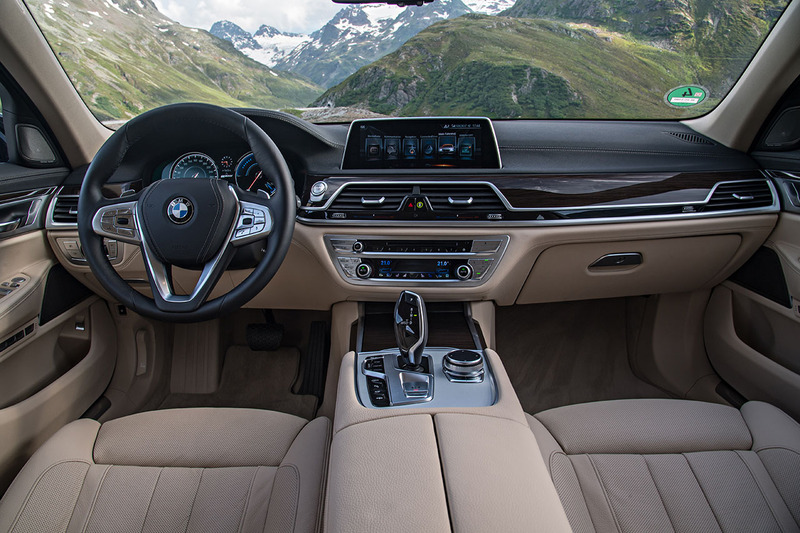 Among the most prominent hybrid-specific features in the interior alongside the eDrive button are the special graphic displays in the instrument cluster and Central Information Display. The CID can display the energy flow with real-time information about the operation of the hybrid drivetrain in combination with the combustion engine, electric machine and high-voltage battery and indicate the charge level of the Li-Ion battery. 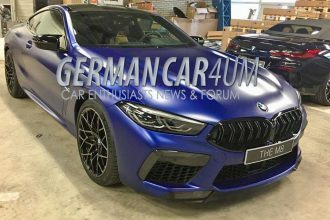 Details on the car’s electric range and overall range can be called up at any time, as can the current gasoline/electric power consumption, the flow of regen electric energy into the high-voltage battery and the progress of a charge. 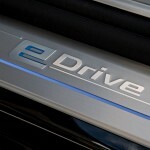 The iDrive operating system also offers hybrid-specific menu items and displays. During the course of a journey, the driver can call up an energy flow graphic providing information on the interaction of the combustion engine and electrical machine, as well as the supply of energy into the high-voltage battery. Other Infotainment functions include displays detailing the car’s gasoline/electric power consumption history and the distance covered on electric power alone, not to mention a diagram showing how the hybrid system is using navigation data to prepare for an imminent change under the current driving profile. 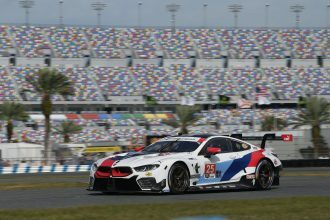 Standard equipment includes auxiliary air conditioning. 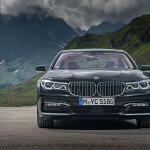 The high level of standard equipment for the BMW 740e xDrive iPerformance includes LED headlights, the BMW Display Key, the ConnectedDrive navigation package, smartphone integration with wireless charging for mobile phones, an iDrive operating system expanded to include a touchscreen function for the Control Display and the globally unique BMW Gesture Control feature. 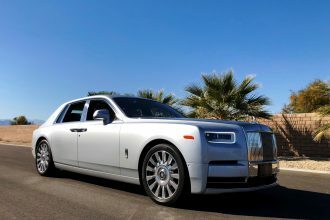 Customers can also look forward to auxiliary heating and air conditioning, which allow them to precondition the car’s interior temperature in advance. The heating and air conditioning system of the plug-in hybrid models is supplied with energy via the high-voltage battery and works almost silently due to the electric operation of the refrigerant compressor and water heater. 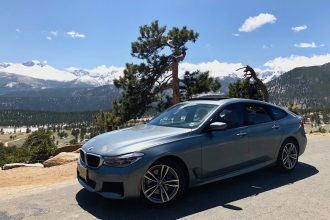 The auxiliary air conditioning function is powered by the mains supply when the car’s battery is being charged, while a timer function allows the advance preparation of the interior and charging of the battery to be programed via the iDrive menu. In addition, the BMW Connected app allows the driver to activate the auxiliary air conditioning function from outside the car via a smartphone. 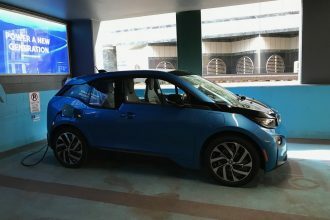 It also supplies information on the charge of the high-voltage battery, the location of public charging stations, the distance covered on electric power alone and the amount of gasoline saved as a result. 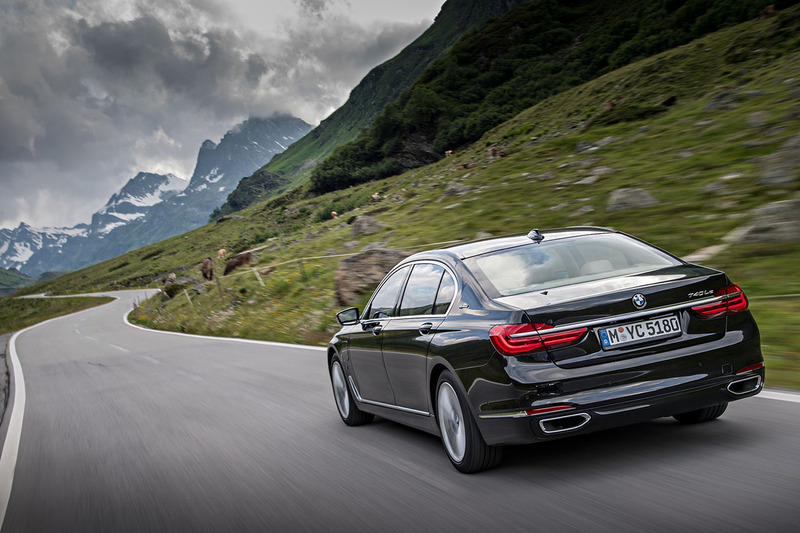 Exceptional efficiency combined with driving dynamics, long-distance comfort and made-to-measure luxury. 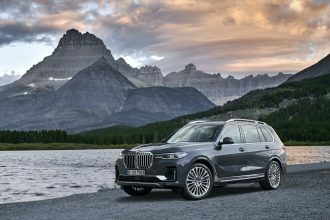 BMW eDrive technology brings together exceptional efficiency and a form of luxurious driving pleasure and long-distance comfort that speaks to both the present and the future. 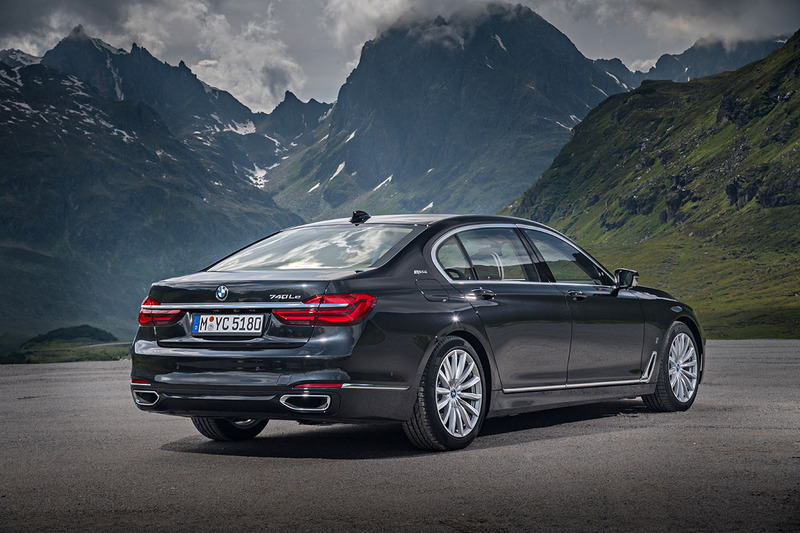 Individually adjustable dynamics and comfort are the product of advanced chassis technology, which in the BMW iPerformance new BMW 7 Series also includes two-axle air suspension with automatic self-levelling and Dynamic Damper Control. 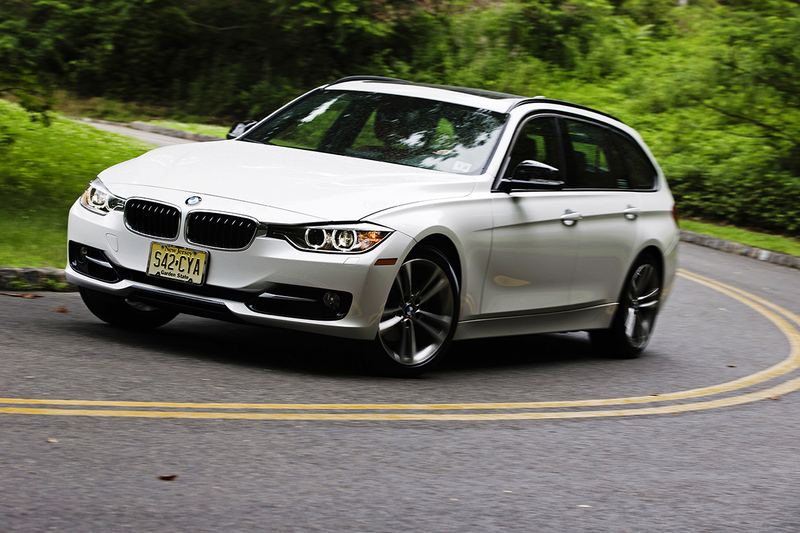 Integral Active Steering, meanwhile, is available as an option. Occupant protection is provided by an extremely high-strength passenger cell, generously sized deformation zones and precisely defined load paths to redirect impact energy. Other standard safety equipment include: front and side airbags, head/curtain airbags for the front and rear, three-point inertia-reel seat belts with belt force limiters and belt tensioners in the front seats, ISOFIX child seat mountings in the rear. Another item on the long list of standard equipment is the Ambiance Lightning, which includes the LED Light Carpet and Ambient highlight in the rear compartment. Optional features providing an exceptionally luxurious way to travel are the Bowers & Wilkins Diamond Surround Sound System and the Ambient Air package. 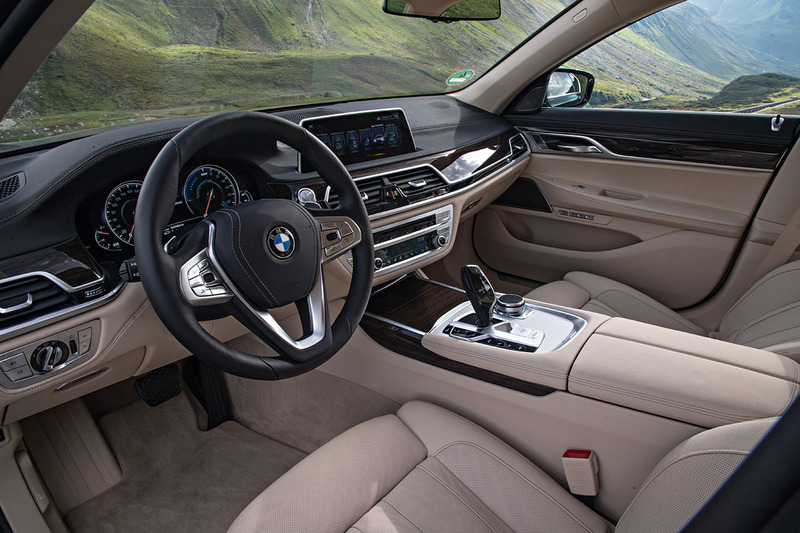 Customers can also specify comfort seats, active seat ventilation, the massage function with Vitality Program and the heated front and rear armrests for both front and rear seats. The Panoramic Sky Lounge LED Roof is also available as an option. 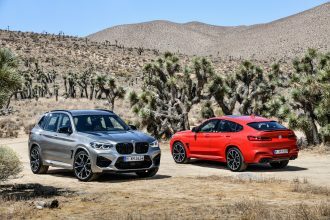 The selection of driver assistance systems includes the new-generation BMW Head-Up Display, Parking Assistant, Active Driving Assistant, Active Cruise Control with Stop & Go, Active Lane Keeping Assistant with side collision avoidance and Surround View systems. 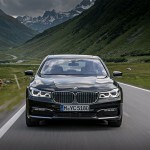 The BMW iPerformance variant of the new BMW 7 Series can also be specified as an option with the M Sport package, an Interior Design Package and BMW Individual Design Composition.